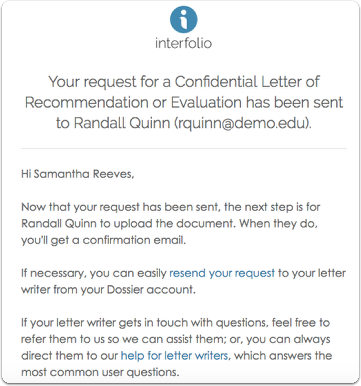 When you apply to an Interfolio-hosted position, you will be given a free Interfolio Dossier account that you can use to collect and submit your materials, including confidential letters of recommendation, all for free. Using our convenient, easy to undertand online application process, you can fulfill specific requirements set by the institution, complete any forms they have requested, and review your completed application at any time. 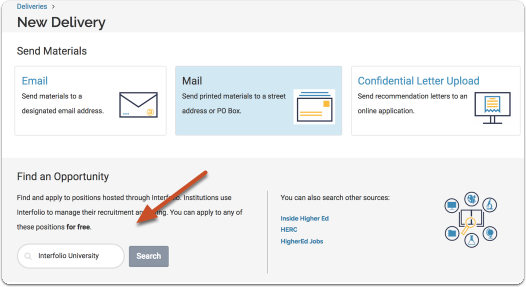 When you've completed applying for your Interfolio-hosted position, you'll still have your free Dossier account for collecting and storing materials. You can also search for more opportunities from directly within our program. 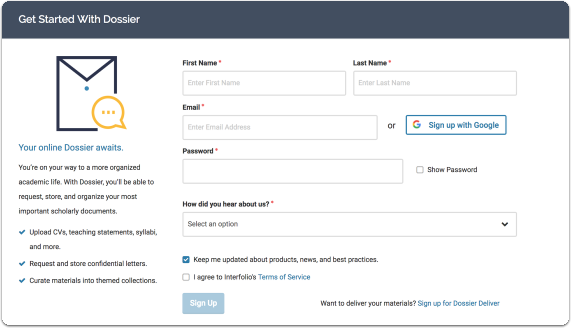 Applying and sending materials to Interfolio-hosted positions is always free, but we encourage you to consider signing up for our premium service, Dossier Deliver, so you can send the materials in your Dossier wherever you need them to go! Click here to learn more about the advantages of Dossier Deliver. 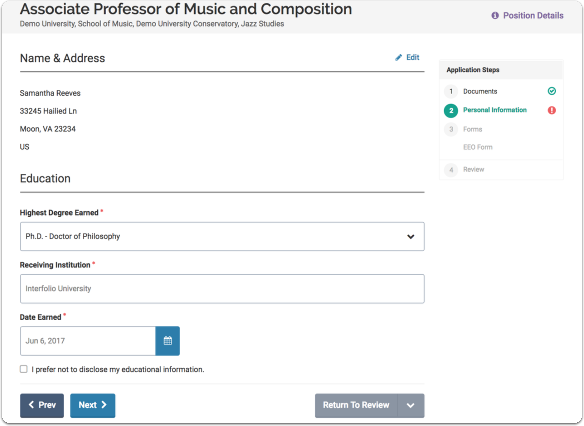 If an institution is using Faculty Search to run a search, you will be able to apply online just by clicking the "Apply Now" button in the position announcement. 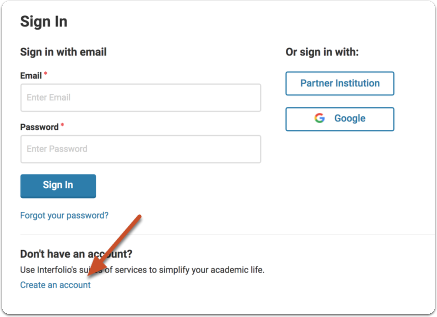 Sign in if you already have an account with us, or click to "create an account"
Note that you can sign in with your institutional ID if you have a Dossier account through your institution, or sign in using your Google account. Fill out the account info, create a password, agree to our terms of service and click "Sign Up." Complete your profile to get started. We will provide this information to the institution to which you are applying. 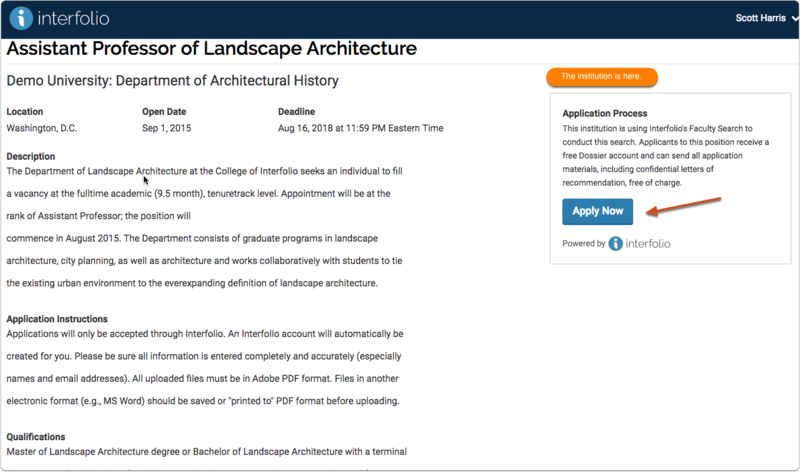 Applying to an Interfolio-hosted position is a guided step-by-step process. An overview of the application steps are listed to the right of the screen. Steps that still need completion will be marked by a red exclamation point. You will see a list of required materials along with the number required. You will need to satisfy all document requirements before submitting your application. 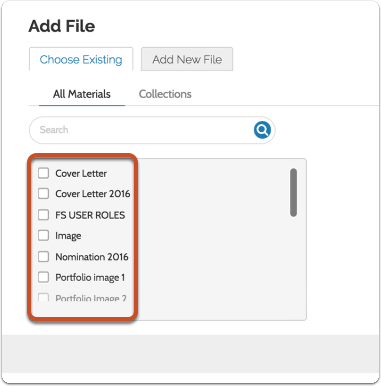 You can add files from a few different sources, but if this is your first time using Interfolio's Dossier to apply for a position, open the "Add New File" tab to begin adding materials to the application. All materials you add here will automatically appear in your Dossier account where you can use them for other purposes such as future reviews or applying for other opportunities. 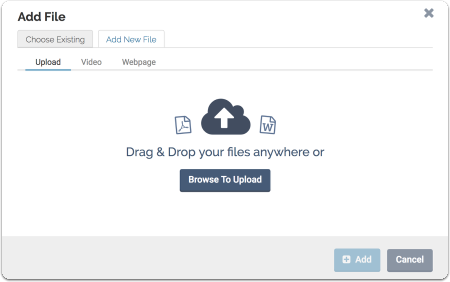 From here, you can drag & drop, or browse for files to upload. You can also add links to videos and webpages if necessary. See here for more information on how to link to webpages in your Dossier and how to add Youtube and Vimeo videos to your Dossier. 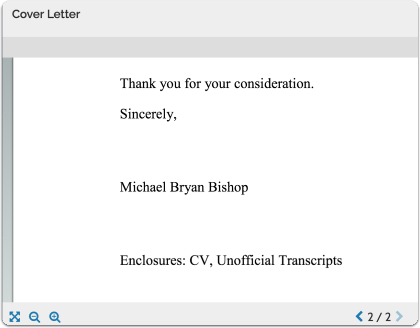 "Type" describes the material and indicates which requirement it satisfies such as; C.V., cover letter, research statement, etc. 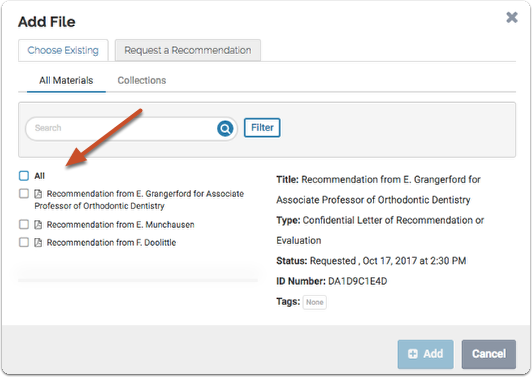 If you have already uploaded materials to your Dossier account they will show up in the dropdown list on the tab labeled "Choose Existing." 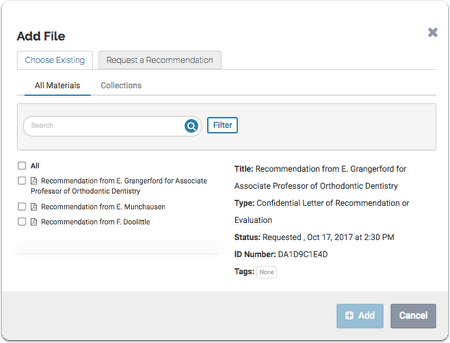 If your application requires a confidential letter of recommendation, you can request that letter through Dossier. 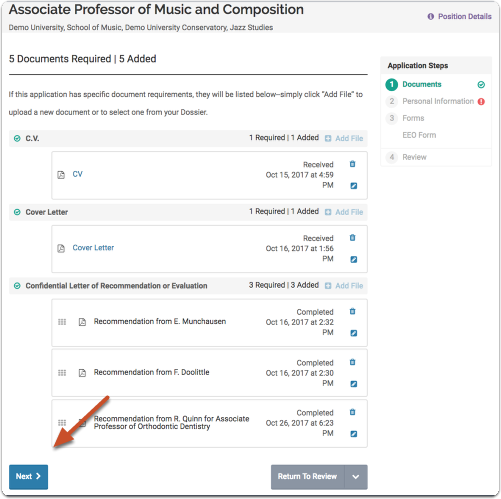 We will automatically attach the letter of recommendation to your application when we receive it from your letter writer. 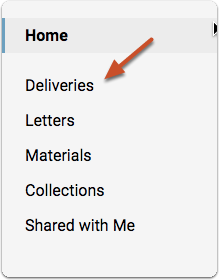 Note that you can filter the list by keyword to quickly find particular letters. 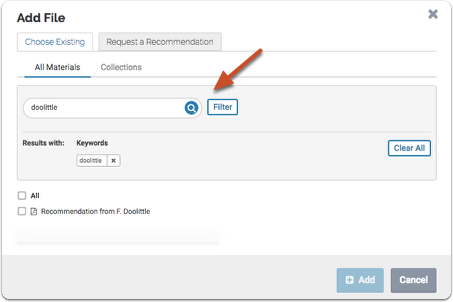 Simply enter your keywords and select "Filter." 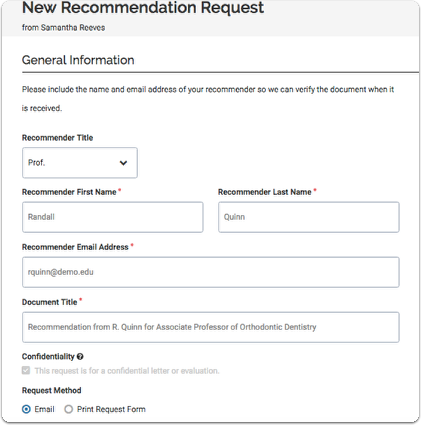 To use existing recommendations" Select "All" to add all letters of recommendation in your account to the application, or select the individual letters you want to include, and click "Add"
You will receive an email notification that your letter request has been sent. Your request will appear with the status "Requested" until the letter writer accepts or denies the request. If they accept, the status will be listed as "Pending" until we receive the letter. Note that to complete the requirement, you only need to have requested the letter. The requirement is considered complete when all required letters have been requested and have a status of added. When deleted from here, the document will be removed from the application ONLY. A copy will remain stored in your Dossier account. 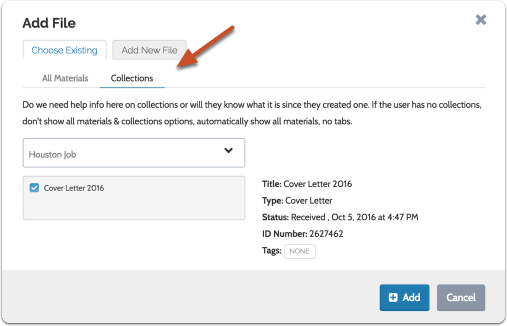 Note that you can select from collections of materials, and filter the list of materials to find particular materials quickly. 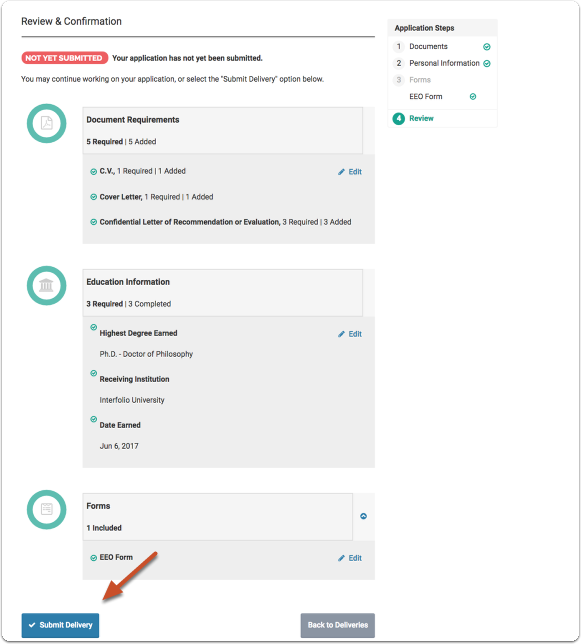 Verify your name and address, select the highest degree you have earned, enter where and when you earned the degree. Note that you can choose not to disclose your education information. Click "Next" when you are finished. Simply fill out all forms and click "Next" when you are finished. This page gives an overview of your progress toward completing the application. Each section must be completed before you can submit your application. 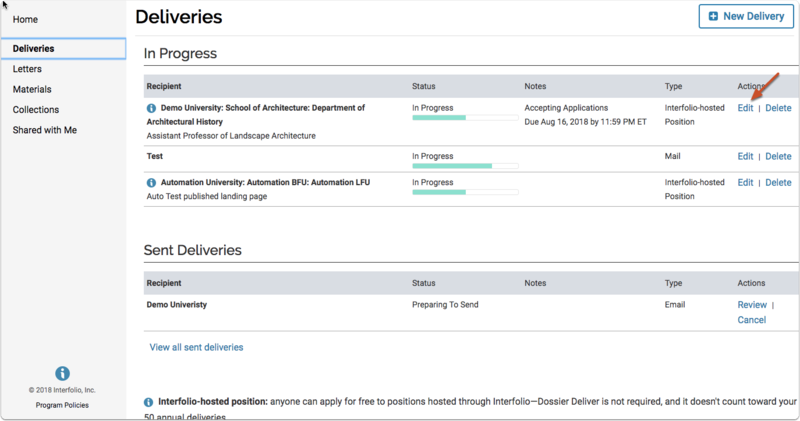 You may review, edit, and track your Interfolio-hosted positions by navigating to "Deliveries." 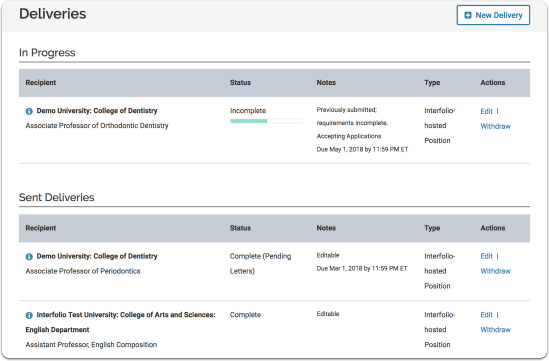 Remember, we keep the materials you use for Interfolio-hosted applications in your Dossier, and with your free account you can use Interfolio to manage all of your supporting materials for academic opportunities. 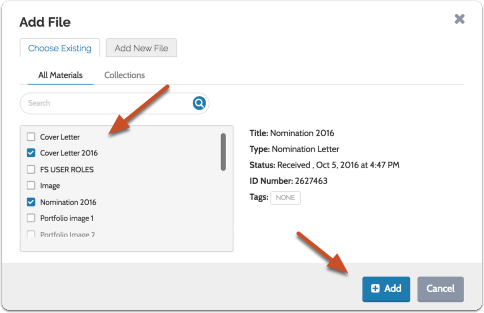 With an upgrade to Dossier Deliver, you can create and send deliveries of your Dossier materials to the places you need them to go! 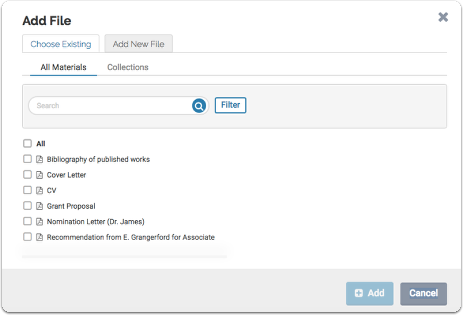 See here for more information on how to use your account to manage your Dossier materials. Enter search terms under "Find an Opportunity"
Try searching for the name of an institution, a position title, or position type. A list of open Interfolio-hosted positions matching your search terms will appear. 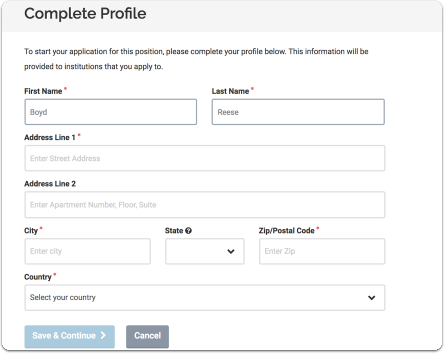 Click the title to view position details such as description, qualifications, etc. This will open a page with results from your search on the selected site.